A Christogram is a combination of letters (a monogram) that forms an abbreviation for the name of Jesus Christ. A monogram consists of linking overlapping letters or graphemes to form one symbol. Different types of Christograms are associated with the various traditions of Christianity. However, the most popular Christograms are IHS, INRI, and the Chi-Rho. Each of these Christograms represents Christ, and they are included among the so-called Nomina sacra (Latin: "Sacred names") of Jesus. The Nomina sacra were abbreviated divine titles in early Greek language versions of Jewish and Christian scriptures. Starting in the third century, the nomina sacra were sometimes shortened by contraction in Christian inscriptions, resulting in sequences of Greek letters such as IH (iota-eta), IC (iota-sigma), or IHC (iota-eta-sigma) for Jesus (Greek Iēsous), and XC (chi-sigma), XP (chi-ro) and XPC (chi-rho-sigma) for Christ (Greek Christos). Here "C" represents the medieval "lunate" form of Greek sigma; sigma could also be transcribed into the Latin alphabet by sound, giving IHS and XPS. A chrismon is one of number of Christian symbols intended to represent aspects of the person, life, or ministry of Jesus Christ and the life, ministry, or history of the Christian Church through a single image, emblem, or monogram. The term "chrismon" comes from the Latin phrase "Christi Monogramma," meaning "monogram of Christ." Chrismons can be found in all sizes, any sort of construction, and are used in numerous applications. Perhaps most commonly, chrismons are used to adorn liturgical devices and Christmas Trees during Advent and Christmas, where they are made from various materials ranging from needlepoint to woodwork and metalwork. They can also be found as decorations in and outside of Christian church buildings and homes, and even found on gravestones and personal stationary. 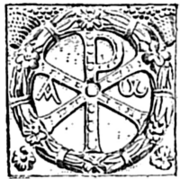 One of the oldest Christograms is the Chi-Rho or Labarum. Technically, the word Labarum is Latin for a standard with a little flag hanging on it, once commonly used in the Roman army. A Christogram was added to the flag with an image of the Greek letters Chi Rho, in the late Roman period. It consisted of the superimposed Greek letters Chi Χ; and Rho Ρ, which are the first two letters of Christ in Greek. Labarum or "Chi Rho," which is the Greek letters Χ ("chi") superimposed upon Ρ ("rho"). Often, the Ρ is formed to look like a shepherd's crook and the Χ like a cross, symbolizing Jesus Christ as Good Shepherd of his flock, the Christian Church. Therefore, although the Chi Rho and labarum are not originally synonyms, they became closely associated over time. The most commonly encountered Christogram in English-speaking countries today is the X (or more accurately, Greek letter Chi) in the abbreviation Xmas (for "Christmas"), which represents the first letter of the word Christ. In the Latin-speaking Christianity of medieval Western Europe (and so among Catholics and many Protestants today), the most common Christogram is "IHS" or "IHC," derived from the first three letters of the Greek name of Jesus, iota-eta-sigma or ΙΗΣ. Here the Greek letter eta was transliterated as the letter H in the Latin-speaking West (Greek eta and Latin-alphabet H had the same visual appearance and shared a common historical origin), while the Greek letter sigma was either transliterated as the Latin letter C (due to the visually-similar form of the lunate sigma), or as Latin S (since these letters of the two alphabets wrote the same sound). Because the Latin-alphabet letters I and J were not systematically distinguished until the 17th century, "JHS" and "JHC" are equivalent to "IHS" and "IHC." "IHS" is sometimes interpreted as meaning Iesus Hominum Salvator ("Jesus, Savior of men," in Latin), or connected with In Hoc Signo. Some uses have even been created for the English language, where "IHS" is interpreted as an abbreviation of "I Have Suffered" or "In His Service." Such interpretations are known as backronyms. Its use in the West originated with St. Bernardine of Siena, a thirteenth century priest who popularized the use of the three letters on the background of a blazing sun to displace both popular pagan symbols and seals of political factions like the Guelphs and Ghibellines in public spaces. Within Western Christianity, many crucifixes and other depictions of the crucifixion include a stylized plaque or parchment, called a titulus or title, bearing only the Latin letters INRI, occasionally carved directly into the cross, and usually just above the head of Jesus. INRI is an acronym of the Latin phrase IESVS·NAZARENVS·REX·IVDÆORVM (Jesus Nazarenus, rex Judæorum), which translates to English as: "Jesus Nazarene, King of the Jews." It appears in the New Testament of the Christian Bible in the Gospel of John (19:19). Each of the other accounts for Jesus's death have a slightly different title on the cross: Matthew (27:37) "This is Jesus the King of the Jews;" Mark (15:26) "The King of the Jews;" and Luke (KJV) "This is the King of the Jews." The title was written in Hebrew, Greek, and Latin. Christian mosaic from Greece. 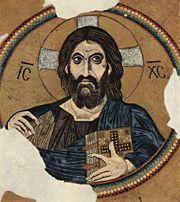 The Christograms IC and XC are found on either side of Jesus' head. According to biblical narrative, Pilate challenged Jesus to deny that he was the "King of the Jews." The gospel accounts claim that Jesus did not deny the accusation. Therefore, some believe that the justification for his crucifixion was his claim to an illegitimate title. The title INRI was placed above his head on the cross. However, John 19:21-22, alludes that Pilate rejected the charge that Jesus was crucified because he falsely claimed to be king and instead stated that Jesus was crucified because he was the King of the Jews. Thus, some Christians as early as the second century report that Pilate was convinced that Jesus was the Messiah. In Eastern Orthodoxy, the most widely used Christogram is a four-letter abbreviation ICXC—a traditional abbreviation of the Greek words for "Jesus Christ" (that is, the first and last letters of each of the words ΙΗΣΟΥΣ ΧΡΙΣΤΟΣ—written "IHCOYC XPICTOC" with a transliteration of the lunate sigma common in medieval Greek as "C"). On icons this christogram may be split: "IC" on the left of the image and "XC" on the right, most often with a bar above the letters, indicating that it was a sacred name. It is sometimes rendered as "ICXC NIKA," meaning "Jesus Christ Conquers." "ICXC" may also be seen inscribed on the Ichthys. Moreover, in the traditional Orthodox icon of Christ Pantokrator, Christ's right hand is shown in a pose that represents the letters IC, X, and C.
↑ Tertullian, Apologeticum c. Gentes, chapter 21 (198 C.E.). Retrieved August 16, 2008. Paap, A.H.R.E. Nomina Sacra in the Greek Papyri of the First Five Centuries, Papyrologica Lugduno-Batava VIII Leiden, 1959. This page was last modified on 20 May 2013, at 16:00.